"A New Autumn Beginning" at Red Brick Gallery - Go Foxburg! Summer begins to wane and as autumn approaches the landscapes of the Allegheny and Clarion River valleys begin to take on a special hue in the changing light. It is a splendid time to have the pastoral and natural abundance of our area captured in paintings by a talented local artist in an exhibit at the Red Brick Gallery in Foxburg on Main Street. Allegheny RiverStone Center for the Arts enthusiastically announces a new exhibit at its artist cooperative the Red Brick Gallery and Shop beginning on Sunday September 21st. 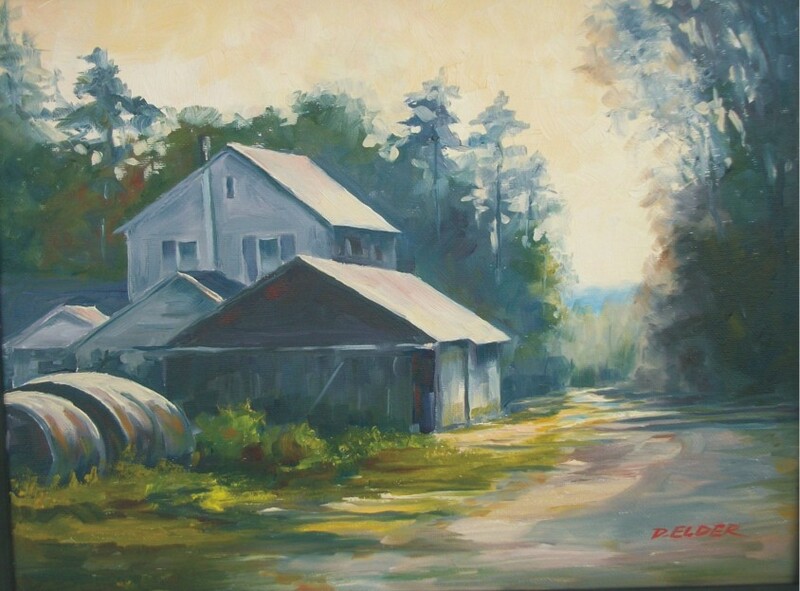 The works of local painter Doug Elder which capture time frozen moments and convey a special rural and natural nostalgia will be displayed in the Upstairs Gallery through October 12th. Doug Elder is native of Scrubgrass Township Venango County. Doug is by trade a sign painter working quietly and diligently from his unpretentious studio and shop on a small farm near the meandering Allegheny River. He is a self taught artist who paints predominantly in oils, pastels and occasionally acrylics for his larger mural works. He has displayed his paintings in galleries in Pennsylvania, New York, and in Arizona. Doug takes time to share as he teaches an “Advanced Painting Studio” class at Butler County Community College. His signs are by themselves works of art using vivid color and detail. 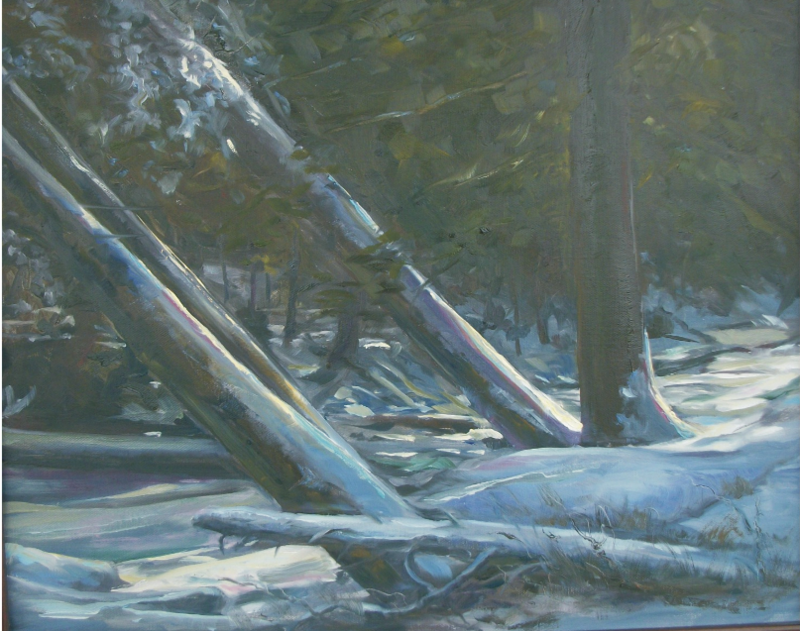 In contrast his paintings are more subtle in color, muted, and evoking emotion. The paintings often portray a quiet or restful country scene that draw one to it; to linger and wanting to say “I know that place.” It is certain he is a master of both crafts. Plan to attend the Opening Reception on Sunday, September 21 from 3:00 to 5:00 PM and have the opportunity to share your impressions with the artist Doug Elder. Before the reception you can enjoy a marvelous concert at Lincoln Hall at 2:00 PM as Allegheny RiverStone Center for the Arts presents; Young Artists and Pittsburgh Concert Society (PCS) Competition Young Winners from age 12 to 20: Pianists, Caroline Fedor and Stephanie Petinaux; Joel Goodloe, Baritone; Hannah Piston, Harp, who will charm and delight the audience with their exuberant talent. ARCA established the Red Brick Artist Cooperative in 2011 to provide area artists a suitable venue for the display and viewing of their works, as well as a consignment sales outlet for the members, who all volunteer their time to have the space open to the public. The Gallery’s home is a charming and historic 135 year old building that was once the business office of the Fox family from Philadelphia and the namesake of the Foxburg village. It was attractively restored in 2004 by its current owners, who are also ARCA members, and became known as The Red Brick. The building also serves as the office of the Allegheny RiverStone Center for the Arts, a regional non- profit organization fostering the performing arts in the northern Allegheny River valley and encouraging local artists efforts. The Red Brick is located at 17 Main Street in “downtown” Foxburg and is open on weekends. Members are local and regional artists who include painters, weavers, photographers, and potters. Store hours are Friday 4:00 PM to 8:00 PM, Saturday 11:00 AM to 8:00 PM and Sunday 11 AM to 4 PM. To reach by phone call during open hours 724-659-0003.